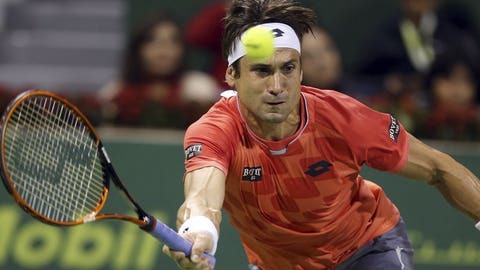 SOELDEN, Austria — Eighth-ranked David Ferrer clinched his 26th career win after rallying to defeat Steve Johnson of the United States 4-6, 6-4, 7-5 at the Erste Bank Open Sunday. The top-seeded Spaniard improved to 5-0 in finals this season after also winning in Doha, Rio de Janeiro, Acapulco, and Kuala Lumpur. The 47th-ranked Johnson, who was playing in his maiden final, took a quick 3-0 lead. He lost serve at 4-2 but broke Ferrer again at 5-4 to close out the first set. Three straight breaks at the start gave Ferrer an early advantage in the second.